Anna, from the blog, Thimbleanna. I've been following Anna's blog for a long time now and I am so happy she agreed to share a little bit of her creative space with us. She's got some great organizational tips and I know many of you will be able to relate to Anna's room ~ so check it out! 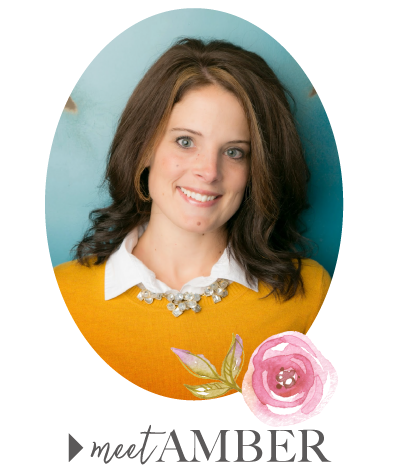 I'm Anna from the blog, Thimbleanna and I'm very excited to be posting here on Amber's blog for Tuesday's Tips. 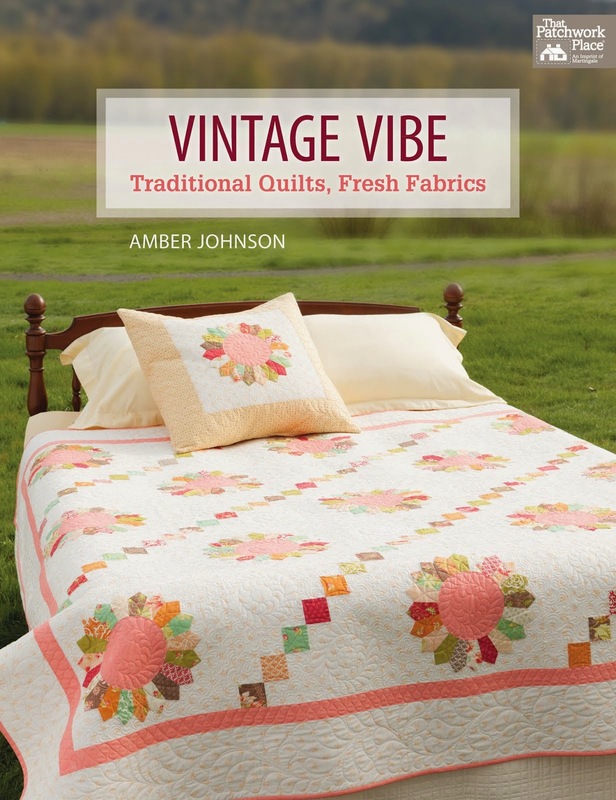 I had the honor of meeting Amber at quilt market in Salt Lake City last spring -- and she's just as sweet and talented as you'd imagine from her blog (which I stalk, btw!). I really had to laugh though, when Amber asked me to post for Tuesday's Tips. My sewing room is anything but glamorous, but then I thought that my ugly might be beneficial?!? Tip #1: Work With What You Have! 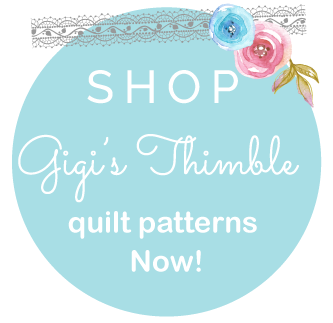 There are so many beautiful, inspirational sewing rooms on the internet and it's easy to become discouraged if your room isn't drool-worthy. I love seeing those gorgeous rooms and I often get some great ideas from them, but that's not my reality. My sewing room is in the basement of our home and my sewing companions are the furnace and water heater. 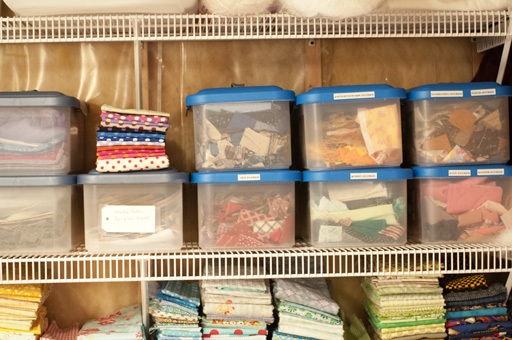 I've often debated about turning one of my now-grown-boys' rooms into my sewing room -- it would be much prettier and I could have a window, but I wouldn't have enough room to store all of my supplies. So, I'm working with what I have and staying in the basement. I lovingly refer to it as the dungeon and I try to put a positive spin on it. My fabrics and threads won't be damaged by sunlight, right? The reality is, I don't need a beautiful room to create pretty things. I just need some supplies, my sewing machine, a few notions, and a little organization to be able to find things. When we moved into our home, the mechanicals were all on one side of an unfinished storage room, so I blocked them off with a few old hutches so that I can't see the ugly stuff. That left me with three walls -- two walls were unfinished but lined with shelving (perfect!) and a third wall was unfinished studs. The first thing we did was put pegboard up on the stud wall. I love this wall for holding notions. Someday, when I have time to frou-frou-up my sewing room, I'll put some cute stuff on this wall. Below the bins are some of my fabrics. 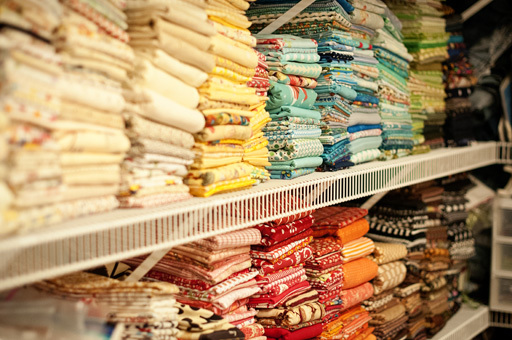 Tip #2: Fold Your Fabrics Nice and Tidy! When I first started blogging I stumbled upon Monica's fabric folding technique. It took me 3 days to fold all of my fabrics, but it changed my life! ;-) Since my shelves are all open it's really nice to have neat fabric stacks instead of the unsightly mess that I used to have. I'd love to have some of those really cool ribbon shelves but I don't have anywhere to hang or set them. So, I improvised. I took a dowel rod and suspended it from one of my shelves with some wires. It works great to hold a lot of my ribbon spools. I do have one really cool Pottery Barn organizer that my sister gave me a few years ago for Christmas. I helps cover up some of the unfinished walls -- you can see how the ribbon looks hanging above it. Now, one last tip -- my favorite. 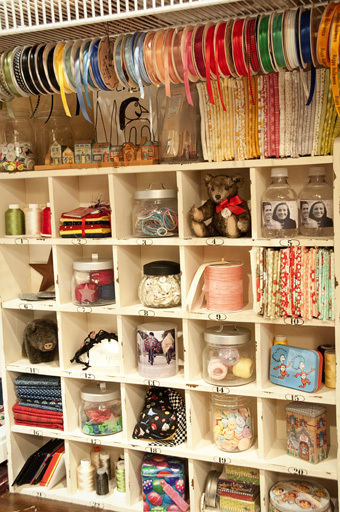 Tip #3: Add a Little Whimsy to Your Sewing Room! It will make you happy. Here's my favorite embellishment to my unfinished room -- Shandi the Chandelier. A few weeks ago I had a few of my work friends over and they begged to see my sewing room. I was very hesitant to let them see it -- I know all of you crafty types would understand, but none of them are obsessed like we are and I worried that they might think I need psychological help when they saw all of my fabric and doodads. I finally gave in -- I'm not sure what they were thinking, but I do know that when they saw Shandi hanging from the floor-joist-ceiling, they all laughed and ooohed and aaahed. It was a fun moment for Shandi and me! Some great ideas Anna! I definitely want to check out that link to Monica's fabric folding technique and I love how you've displayed all the loveliness that allows you to create the beautiful things that you do. Please leave Anna some comment love below. She's so sweet to have shared her creative space and some great tips with us today. i think your sewing room is wonderful and spaceous. I sew in a guest bedroom and most everything is in dressers in the closet in drawers in the chest. Love that you can see everything in your room. I learner over the years that if you want to sew, you will find a place. I think I have sewn in the kitchen, bedroom, utility room, dining room, probably everyroom except the bathroom. Thank you for sharing. Thanks for sharing your sewing space. Lots of great ideas especially thanks for the link to Monica's fabric folding technique. What a cool STUDIO!! I like that folding way too, but my shelves are not very deep so I may need to double fold at the end..... I sure don't feel bad now, my stash is small compared to this! It's still nice to have a room! Not just a corner like a lot of us have! It is a well organized one that's for sure! Yes Thimbleanna be very glad you hgave a room /studio/ basement/ dungeon. I only have a cupboard where my supplies live and my sewing machine carry bags( on wheeels ) My sewing machine sits on the end of a very very large long kitchen bench when I am using it; behind which is an equally large table for cutting and assembly purposes. If I converted a bedroom I would have a fraction of the space I now use. So each of us is differnt, but I agree being tidy and organised is my key. Time is my problem - having enough of it! So I heartily agree with you statemnet work with what you have. Great post Anna. It takes a braver woman than I to let someone peak into the sewing room. Your space is wonderful. I absolutely love your board with all of you tools displayed. It reminds me of Julia Child's kitchen pegboard with the pan outlines drawn on it. Anna, I have taken over a bedroom as my sewing room but I would gladly trade you. 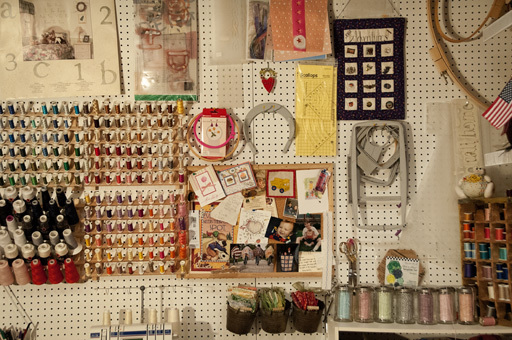 Mine isn't nearly as nicely organized and I just might give an arm and a leg to have that pegboard. And my light fixture isn't anywhere as wonderful as Shandi. We won't even mention how clean and organized you are....amazing. Creativity doesn't get any better than that! Your sewing room looks wonderful! All your fabric brighten it up like sunshine! I love the peg board with all your notions hanging on there. Anna, I love your blog first of all. Your Shandi is very pretty. I think there are more of us working with what we have than the ones with the fancy sewing rooms. I have no basement, so I use a bedroom. I have made it my own, but I am always looking for ideas to be/stay more organized. Thanks for the fabric folding link. I guess I know what I'll be doing tomorrow. Anna, you have a beautiful sewing space. I'm in a bedroom and I'd love to have the room you do. You're very organized too. 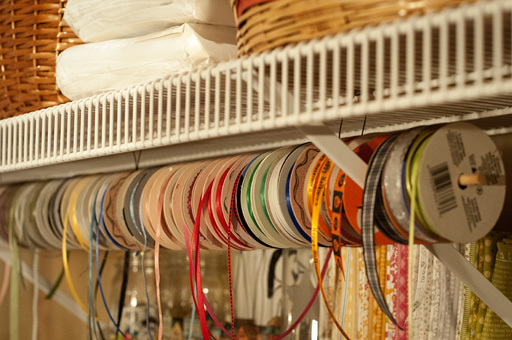 Love your ribbon storage idea! Amber, I haven't commented lately but I'm really enjoying Tuesday Tips! Love the dowel idea for the ribbons! You have a great space and I love the way everything is organised to work for you. It looks colourful and inviting. Everything looks so nice and organized! You had me at the ribbon spools. I'd love to have a wall full for my bookmarks! What a great attitude about your space. We all fall into that trap that our space doesn't look as fabulous as some of those we see, so we feel inadequate. But you are right, we need to work with what we have. Because after all, it isn't about the space, it is about the creativity that happens within the space. 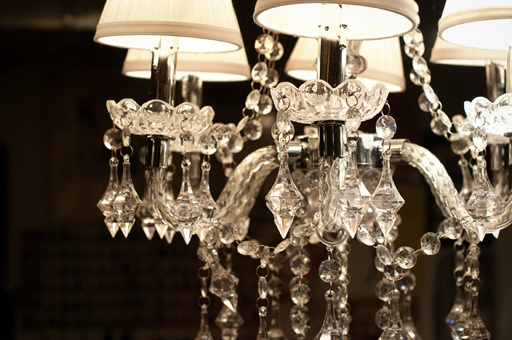 I love the chandelier, and how cute that you named it! Anna, I will have to show this to Malcolm, as he never believes me that there are quilters who have more stuff than me!! Now I want a chandalier - much more stylish than my strip lights!! Anna's room is lovely. It is inspiring and so are her thoughts. My favorite is the open shelves. Fabric folded pretty is delightful to behold. Great contribution! My sewing room is also located in the basement with the furnace and hot water heater. I have a large desk, a banquet table, an old dresser and some plastic bins to hold my do-dads. I added whimsy by painting the block walls a very bright yellow! I, like the others, need to check out the fabric folding technique as my fabric is currently stored in a shameless way!! Thanks for all the inspiration. Love your attitude about your sewing space! 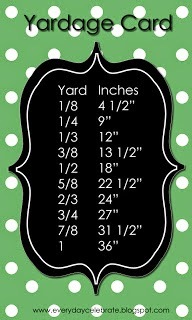 It’s beautifully organized, it works for you and I know why Shandi is the icing on the cake! Your sewing room is pretty fabulous! Hope you had a wonderful Christmas with your family. I have to say that Anna is one of my long time favorite blogger friends and I love the post she shared with us. The chandelier is amazing. I wish I had a taller ceiling to have one. I'm actually looking into lighting for my newly finished sewing room after some water damage that caused a domino effect. I was pretty lucky to be a beneficiary of that little disaster. I think your space is wonderful. It's just nice that you have one right? I love your ribbon hanging there. I just had hunka make me a made do thingy for mine. Not fancy at all. But it will work for me. Would love to see more of your sewing room. Finally a craft room I can relate to, I have bounced around my house, having 2 craft rooms at one time and still unorganized and a mess. Thank you for inspiring me to go back to the basement where I began almost 3 years ago. This is the best post about working with what you have that I have read. I am almost in tears with relief,the ideas you have shared have given me the inspiration and courage to put all my stuff back in our unfinished basement. God bless you with more creativity and loveliness. If you were here I would give you the biggest hug of appreciation.